Photos and text by Lindsey Johnson. Moving. It’s been on my mind the last month or so. We just made a move to a new city in the same state. Design Mom moved halfway across the world. Five years ago we packed up and moved across the country with a newborn and two toddlers. We’ve all done it at one time or another. Some moves are bigger and more hectic than others. But let’s just get this out there: moving stinks! I don’t know one person who has ever said, “Moving is great! I love it!” Quite the opposite! That’s because it’s just plain miserable most of the time. Packing up all of your belongings, schlepping them to another town, state, or country? Not fun at all. Am I right? Ready to get packing? Let’s go! To start, I always plan my packing around the end goal, which is, Secret #1: to be able to find everything when I need it. That seems kind of obvious, but once there are dozens of stacked boxes all over the place and everything feels disorganized and messy, you might not be able to find that box with the pair of scissors or pocket knife you need to start opening up all the other boxes. I can’t tell you how many times I thought I would remember what was in certain boxes as I was packing them only to forget a few minutes later — even right after I taped them up! The method I use now does take a little more effort at first, but on the other end of the move, it makes unpacking and organizing infinitely easier. Secret #2: Each room is designated a number. For example – Living Room 100, Kitchen 200, Girls’ Room 300, Boys’ Room 400, Master Bedroom 500, Bathroom(s) 600, Office 700, Storage Room 800, Garage 900, and so on. You could also color code the rooms, but the numbering has worked best for me. Secret #3: I have a clipboard with a notebook or a stack of paper. Each page corresponds to the rooms and boxes in the number series. Some rooms might need extra pages because of a higher number of boxes for that room. This will make more sense in a second. 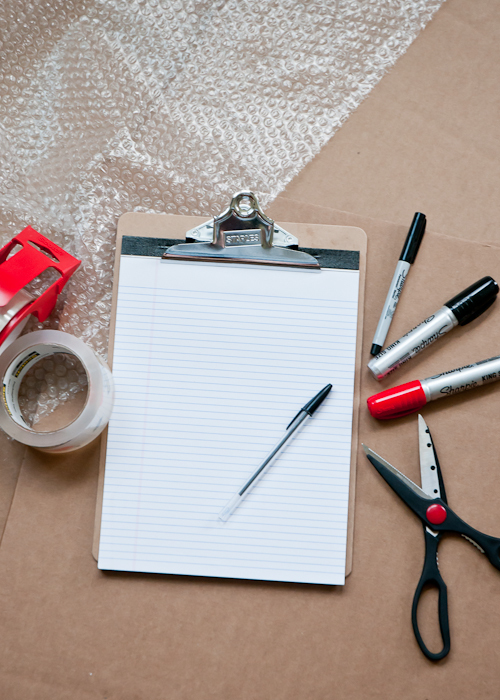 I assemble my supplies — boxes, packing materials (like bubble wrap or packing paper for delicate items), markers, a notebook and clipboard, and dozens of rolls of tape. Then it’s time to start packing the boxes. Secret #4: Each box is numbered so that it corresponds to the room to which it belongs. If I have five boxes for the Kitchen, they would be numbered 200, 201, 202, 203, and 204, etc. 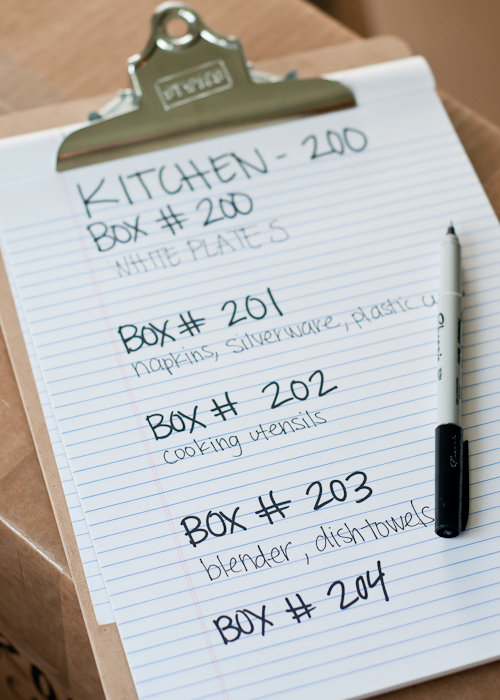 Secret #5: On the clipboard sheets, I will write a general list of what is contained in each box. It doesn’t need to be too specific at this point unless there is a particular item I know I’ll want to find immediately when we arrive at the new place. For Living Room, for instance, I might be packing pictures from the wall, albums, CDs, DVDs, decorative items, and maybe the pillows from the sofa. I would list them in that way on the notebook sheet and even on the box. Sure it’s easy to just write the box contents on the outside of the box. And I do that too, but writing it down on a sheet in an organized way helps me keep track of everything better and if a box inadvertently gets lost, I know what was in it. Make sure to write the box contents down before you seal it up. Secret #6: Inevitably there is are going to be things that may not have a specific place, or they might be things you find under the couch after all of the boxes have been packed. That’s where the Miscellaneous category comes into play. 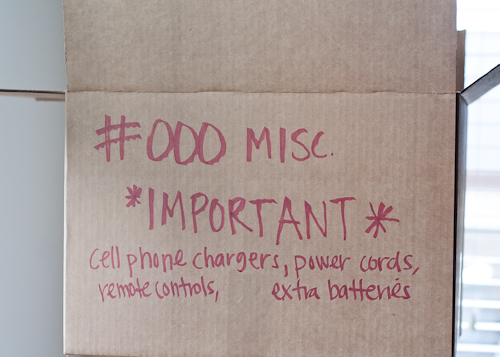 Also, I might have a few boxes marked as Important. This could be my 000 series of boxes. The things in these boxes are going to be things like cell phone chargers, important documents that I don’t carry on my person, or even a family heirloom. Those get marked with red because they are important and I can see that at a glance. Secret #7: Some or all of these boxes are also going to be the boxes that I want to pack with me in the back of the car or will be the last on the truck so I immediately know where they are upon arrival at the new house. I know this might sound a bit excessive and overwhelming, but once you get going it is a snap. The reason I keep doing this is that it works so well on many levels. As the moving van is unloaded, it’s easy to see which boxes go in which room. This is a great help when you have other people helping you. It can be overwhelming to be the one in charge! But this eliminates some of the stress. You know what’s in each box just by looking at it. No more tearing open box after box looking for a lost item. It’s also great for insurance purposes because you have a detailed list of your possessions if anything is damaged, lost, or stolen. Also, some things don’t need to be opened or unpacked right away. 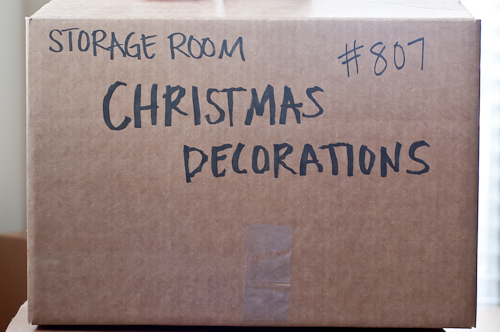 It’s summer now, so if I know I have my Christmas decorations in a box labeled for my storage room, I don’t need to unpack that. But with Fall just around the corner and school starting, I will really need to know where the jackets and sweaters are packed. – Don’t pack books or other heavy items in big boxes! It seems like a great idea until you have to pick them up. For books, use smaller boxes with sturdy bottoms and sides. Tape them well. – When packing fragile items like dishes, use dishtowels, tablecloths, and other similar items that you would be packing anyway to cushion them. – I save original boxes and styrofoam packaging materials for small appliances and electronics (when I can or if I have the storage space) because it’s the best way to protect those items when moving. 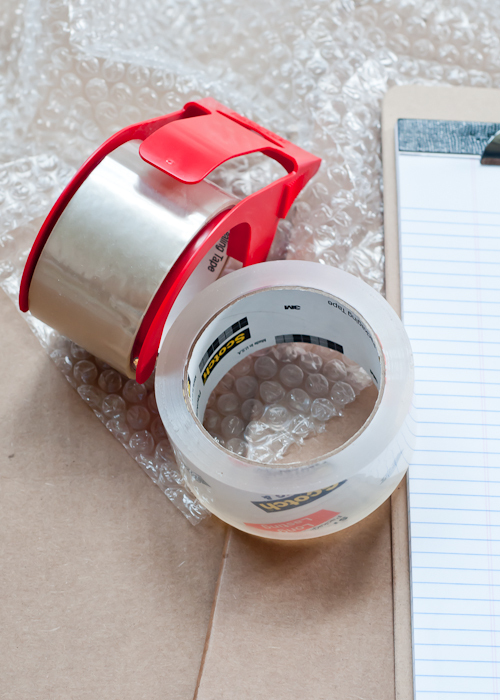 – Stock up on plenty of packing tape. 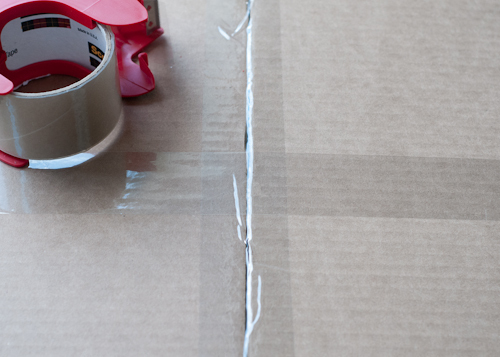 You don’t have to go crazy with taping, but you’ll run out faster than you think. One strip of tape in each direction should be sufficient for a simple across town move. – Moving boxes are expensive to buy! Check Freecycle and Craigslist for free boxes. Another great resource are dumpsters behind restaurants, grocery stores and apartment complexes. Or, ask a friend who has just moved to save their boxes for you. 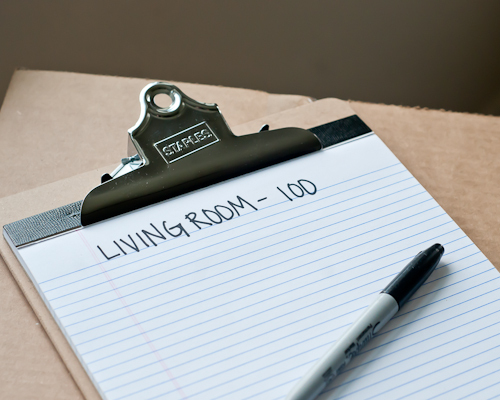 Now tell me, Design Mom readers, do you have any tips for moving home to add to my list? Or maybe more entertaining, do you have any horror stories from moving? Mine involve that cross country move with a newborn. We did one of those u-pack things. The bulkhead that separated our stuff from the other stuff broke and every single item we owned was damaged. Total nightmare! Luckily our move last week wasn’t quite so awful. Live and learn! P.S. — Love secrets? Find all the posts in this series here. Yes, as a matter of fact I do! I have a good if not great tip! Bicycle boxes are super sturdy and are perfect for pictures and mirrors. I also stuff towels/sheets etc. down the sides to keep everything from shifting around. Our local bike shop is huge and they have to pay to throw these away so they are more than happy to give them away. Just get there early in the day as they like to cut them down as it takes less space in the store. We have a move coming up and the moving co suggested this to save on buying boxes. boxes. Thanks for the tip! I love this post so much, as we moved about 15 miles this past December and anticipate another move in a year or two. I’ve done both the list and the labeling of items on the outside of the box, so I can attest to how much more useful the list is! Back when brick-and-mortar bookstores were more common, I used to pick up cardboard flats that were being discarded as moving boxes. I still keep a fair number of these around in storage (flattened, of course), because they are the perfect size for moving books! I will be bookmarking this post for our future move(s). Be very careful about labeling boxes with specific items. Our last move the whole box labeled TOOLS mysteriously didn’t show up at our new house. The Moving company denied any responsibility. Nothing like being in a brand new house with not even a hammer! Oh my goodness, I can relate! Our movers “helped” pack the last few items for us the last time we moved. When we arrived in our new home, our drill had mysteriously disappeared, as had the pack n play that was supposed to be used as a bassinet for the baby who was imminently expected. It happened to my parents, too. When we lost moved, we used one of the big companies and the movers put numbered stickers on every box/piece of furniture. Then you are supposed to check them all off upon delivery before signing the final paperwork. Of course, you are exhausted when this happens. But it is worth doing, however long it takes, because, sadly, movers do sometimes steal. This is so true. Our last move was a big one from Texas to California. We moved for husbands new job. My husband’s new company did all the booking for the moving but wanted my husband out before they were able to accually move us, so that left me there to handle the movers when they came. It was awful. The guys were so rude and wanted my to pay a check directly to them. Mind you with was already paid for by my husbands new job. They were also so verbally abusive, that a friend of mine thought he was gojng to hit me. If i knew i had a choice i would have had them un loaf everything and demanded a new moving company, But everything was already paid for and I did not think I could change. They also would not leave until I gave them a large cash to tip. Once that was done I thought the worst was behind me, but I was very very wrong. When we finnaly got or items over 2 weeks late, every box was ripped open, every piece of furniture was damaged and over $35, 000 of items were stolen. Our boxes were only numbetd so no descriptions for the movers, hence why they went through skl of the boxes. Sorry on phone and posted before, spell check , and finnishing post…. Very crazy, my advise check the moving company with BBB. And do your research even if it is being paid for and booked by a third company that you trust. I know I will not trust a new job to book the moving company again. Now we are getting ready to make an even bigger move. From California to Maryland. Praying this move is much better. I’m currently in the process of moving from Indiana to Delaware. I have enough friends with muscles that I decided a moving company wasn’t neccessary for me. Do you have any tips or advice for me to make my move easier? I’ve never over crosscpuntry before and can use any help possible. Thank you! we are moving from barcelona to washington dc in less than two weeks and you can’t imagine the chaos that has been taking over our house… we are a family of six and even though we don’t have that much stuff, some of it we are still using, other things we won’t need until we buy a house, others we’ll need as soon as school starts but can’t come in our baggage, etc. it’s crazy. moving (across the atlantic, or anywhere else) is crazy. I was madly in love with the industrial size saran wrap for our last move. It was a great way to secure plates together within boxes, and wrap picture frames together to create bundles, and to protect the legs of furniture. While we packed all of our boxes and prepped everything to move, we hired movers to do the actual loading/unloading of the truck and we couldn’t have been happier about that decision. And finally – use moving as an excuse to PURGE! Don’t pack anything into a box that you don’t find beautiful or useful. Unpacking is so much more fun when you only have to deal with things you are happy to have in your life. Yes! We love the plastic wrap too. I have used it to wrap blankets around art & then wrap them all together. When you have it on hand you find a ton of uses for it. Love it, wouldn’t move without it. I totally agree with purge idea! I did a purge during our move a few months ago and I’m very happy with this. I took me some time but it’s a great feeling to begin life in a new place surrounded by things you love – only these things. Where do you buy the industrial size saran wrap? Thanks! I believe Costco and Sams Club sell it! I started packing for my big move a couple months ago and I’ve already filled up 3 large garbage bags of stuff that I didn’t need anymore. I’ve also filled up numerous tubs that were taken to Goodwill for donation. I joked that I wouldn’t have anything left to put in my apartment but I think it’s better to start fresh. Remove anything weighing you down and you’ll essentially be starting your new chapter with a clean slate. I can’t wait to get this move over with, but it has been nice to go through everything I have and take a walk down memory lane. It makes this move even more exciting (: purging is definitely a great idea. Even if you’re not moving out, go through your things periodically to get rid of clutter and free up space. I actually enjoy moving. I like purging and starting fresh. Sort of like Spring, where everything is new again. I’ve found that the liquor boxes are great for moving. They are quite sturdy. I call the liquor store and ask if they have boxes available, then they don’t break them down. And for my other tip, I keep a list and just number the boxes. That way you can avoid the unfortunate experience Joan had, and a sign on the doors of the new house helps others know where the boxes go: Bathroom 1 is 10-15 Master Bedroom: 20-40 etc… That way no one has to direct traffic. I haven’t done a whole-house move ever! And now after 13 years in this home and thinking of selling, I find all of your tips very helpful, thank you, and will keep them in mind:) It may be off topic, but when my son was packing up after college graduation I found an online resource that delivered to him packing supplies (NYC) including boxes, tape, bubble wrap, marker, I think a cutting tool, etc. – things which most young people don’t have on hand – and it was cheap (unexpected) and easy…a good thing to keep in mind for small moves if you’re in the same boat. when we moved, I kept a list of what was in each numbered box. instead of calling a bedroom ‘dorothy’s room’ or ‘girl’s bedroom,’ I labeled my kids rooms thusly: BLUE ROOM or PINK ROOM–which went with the paint on the walls in those rooms. Everything else was pretty straighforward for the movers…our small house doesn’t have that many rooms! My parents actually just moved. My mother used a voice recognition app on her tablet and instead of writing everything down, she just spoke as she was packing up the box with the box number and when she was done, she had a document that she was able to print out and merge into excel by box number- made it easy to search for a specific box. This is brilliant! I have a craft room I will be packing up soon and there are so many little pieces to keep track of. I know it’s been a while since you posted this but do you know the name of the app? I tried to find one that is simple and I can’t really find one. Boxes for any one room are labeled as “1”, “2” or “3”. “1” items are essentials, “2” are nice to have and “3” items are non-essential. So when I move in, I immediately look for all the “1” boxes and unpack them first. When that is done, I go to “2” boxes. The essential stuff I include in “1” boxes are things you will need immediately: toilet paper, cleaning supplies, shelf paper, paper towels, rags, coffeemaker/coffee, one dinner plate/bowl/silverware, laundry soap, pet food/bowls, bath towels, bed sheets, hand soap, etc. When you learn you are moving, you begin to pack all your non-essential “3” things that you don’t need right away. “1” items generally get packed last and unpacked first. Great tips in this article. Thanks! Wine boxes (that hold 6 individual boxes) are my favorite for packing fragile items, glassware, etc. They have built-in protection so I can save my bubble wrap for the picture frames. Those picture frames/oversized decor items seems to fit nicely in the boxes made for winter coats or hanging items. I put a few pillows around them to use of the space, and they arrive in good order. Finally, my rule of thumb with my little ones is always their rooms are the last to be packed up and the first to be unpacked. It is the least amount of disruption for them, and tho I’d love my kitchen to be up and going ASAP, having their rooms done by bedtime makes the first few nights in a new house much less disturbing for them. If someone offers to help, I show them a picture of the former bedroom as it was, and tell them to go for it. I can always rearrange it later, but getting it in working order helps me so much! Right down the street from us we have a used box store. They have all kinds of boxes that are gently used in every shape & size. They are MUCH cheaper than buying new. They also sell big bags of used wrap paper very inexpensively. No matter how much I collect & save before I move, it seems I always end up there to pick up a few things to complete the move. We are in the process of moving to another state. I wish I’d read your list idea earlier. We are using movers for the first time, so I am a bit worried about a box going “missing.” I am being so vague about what is in some boxes, that I know I will be surprised when I open them. As for boxes and such, be careful about used ones. When we moved the last time, we brought carpet beetles with us unknowingly. (They infested us at our old apartment.). It cost us over $1000 to get rid of them. I didn’t know about the bugs until a few months later. Luckily, we recycled the boxes so no one else got them. My point is, boxes might be expensive, but bed bugs or carpet beetles cost more. *carpet beetles eat any fiber so in addition to your cashmere and wool that moths like, they will eat cotton, rayon, etc… Not just your carpets. They are not fun. I think a better idea if you are using movers would be to just number the boxes and then keep the clipboard with all the details so they don’t know what is in each box. these are great tips. they made me feel like a pro, because it sounds like what I’ve been doing. Oh, then I remembered that I moved 7 times in 7 years. I also use clothes to pack around stuff that needs to be cushioned (not good stuff, but t-shirts, sweats, etc), even furniture with edges that might get rubbed. Those boxes made specifically for glasses are genius and worth it! And I have used the same boxes for all 7 moves. They’re a little worse for wear. I’ve moved so many times over the past 7 years (hoorah for student life!) and my “method” has always been shoving loose items in the back of my station wagon and making several trips back and forth. Not surprisingly, it’s a chaotic disaster every time, and I never seem to learn to be organized! When we were moving across the country our Penske moving truck was stolen from a hotel parking lot. They came and hotwired it in the middle of the night and drove off with everything we owned. Not cool. I’d recommend using movers or if you need to go the budget route ABF u-pack worked really great for us on our second cross country move. Anyway, I had no idea moving trucks got stolen but apparently it is rather common. We’ll never use on again for anything but an in town move where we can unpack the whole thing the same day. That’s the worst moving story that I have ever heard! Just horrible! Were your items insured by Penske or was it a total loss? You can get the end rolls of paper (too short to run on the presses) from the local newspaper. It makes excellent packing material! Absolutely love the numbering system and neatly organized you are. Using a laptop could also be another great tool to log your numbers and list of things within that box. So, just in case you ever misplace the papers. Instead of writing on the boxes, I bought a package of labels (like, blank name tag sized) from an office supply store and printed out several sheets for each room: Kitchen, Girl Room, Boy Room, Bathroom, Living Room, etc. While packing, I’d pack by room and just head in with a stack of those pre-printed sheets of labels. I’d slap a label on the upper left hand corner of all 4 sides of each box. This was way faster than writing with a marker, which I know I would’ve eventually given up on, but having all 4 sides labeled made it WAY easier to find things when all of these boxes ended up stacked in piles in the garage of our new home. Your system sounds great, but I guess I didn’t need to know where each item was on the unpacking side – just which room to take things to. So, to each his own, but to me it would not have been worth the hassle of listing items. After college I moved 8 times in 3 years between 3 states and my number one lesson was try to use as many boxes of the SAME SIZE as possible. This makes loading the truck super easy and all the boxes stack nicely on the dolly. Also, my brother spent 28 years in the military and moved countless times. His wife became a bit of a moving expert and when using full service movers she regularly packed her fragile and valuable items herself and generically marked the boxes, keeping a separate inventory list with photos. 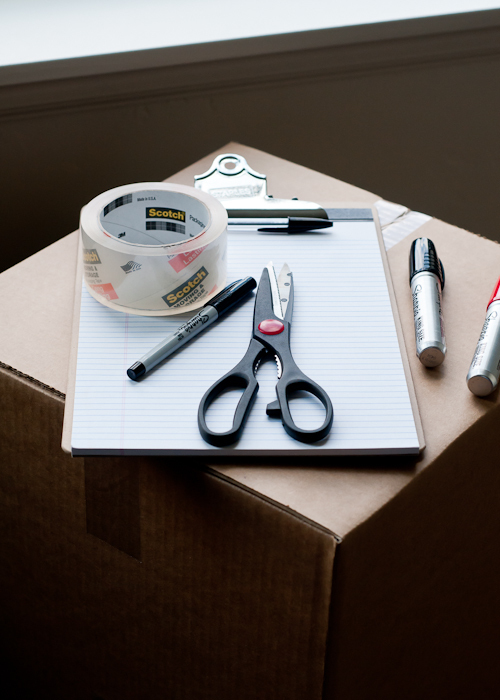 Also – when movers are onsite, ask a friend or two if they have time to help you monitor the packing process. “Professional” movers are notorious for making bad decisions – i.e. packing the cat food bowl with food still in it (yuk!) or putting heavy items on top of soft/breakables. Time is money and they just want to get in and get out. Having extra eyes looking out for you can really help prevent some heartache when you unpack in your new home. I moved from Utah to Illinois about a month ago. We used a rental truck, and after a full day of loading it, the “check engine” light came on the next morning. We had only driven it from the rental place to our apartment, about 5 miles. We lost an entire driving day trying to sort it out with the rental company on a weekend. (Don’t start your move on a weekend, customer service is terrible!) And since we had already checked out of our apartment, we had to stay in a hotel. Luckily, the company payed for our expenses that day and hired professional movers to transfer our belongings into a new truck. If I ever have to move across country again, I think I’ll use PODS, or something similar. PODS isn’t a good idea, but maybe one of the other similar companies would work. PODS is notoriously bad about schedules. We used them on our move from Alabama to Missouri. It was great to load it up at our own pace, but then our POD got lost in their system! It ended up in Canada with all of our stuff, being held in a facility because it didn’t have the correct international paperwork. Well no kidding! It wasn’t supposed to be in ANOTHER COUNTRY! It took over two weeks to get it sorted out and when it finally arrived, it had leaked and we had a lot of damage. PODS blamed our packing on the leak so they wouldn’t cover it. Eventually, they gave us about a hundred bucks off the full price. I don’t mean to sound ungrateful, but that didn’t really solve the problem. If you do an internet search of them, this sort of things happens a lot. Then, we couldn’t get them to come and pickup the empty container. We were moving into a condo and our neighbors had graciously given up their parking spots so we could park our POD. It wasn’t the best first impression to make when the POD sat there longer than the agreed terms and we were on the edge of getting into trouble with the condo association. Using PODS really added to the stress of our move! Since then, we’ve seen some similar companies. I would look into those in the future, but I definitely wouldn’t use PODS again. We chose not to use PODS just because they were ridiculously expensive compared to the other similar companies. We’ve moved cross-country twice (from SC to WI, then from WI to AL) and used U-Pack ReloCubes (same idea as PODS). The company was great! Customer service was awesome and everyone was super helpful. The prices were over half of what PODS was quoting and everything went as scheduled. A few things got broken or scuffed up in each trip, but nothing that you couldn’t expect from a cross-country trip. One of our favorite parts about the ReloCubes was that they’d drop them off at our house and allow us several days to pack them up (and subsequently unpack them), so we could do it slowly over a few days instead of exhausting ourselves in one day, as you do with U-Haul. I highly recommend U-Pack!! I meant that the prices were UNDER half of what PODS was quoting, not over half. Oops! I have moved more times then I care to admit. Oh the joys of renting! I reuse boxes and find it too confusing to label already labeled boxes. So, I always tape index cards on the box and label them. This way I can just yank off the index card when the box is unpacked. Plus I can use different colored index cards or different colored sharpies to easily determine what goes in which room. When we have friends help with packing or unpacking, I even tape the same color of index card on the doorway of the corresponding room, so everyone instantly knows what goes where. Its a bit more effort, but it really makes things easier! This is very timely as we are moving in a few weeks! I love the idea of labeling all of the rooms with a number, it seems so much clearer for the movers than calling them by a person’s name. Does anyone have recommendations on how far in advance you should start packing? I hate having a bare house, or finding myself needing something I’ve already packed. As a result I tend to start too late and end up in a rush. What’s the ideal time frame for packing? I get ants in my pants and always want to start packing like the second I find out I’m moving, so like a month or a couple weeks before I start packing up all the out of season/holiday stuff I know I won’t be using and then all the stuff on the walls, then the spare bedrooms or office or bathrooms we don’t use as much. It drives my husband crazy but it makes me feel less stressed out in case anything comes up last minute. The downside is you feel like you’ve been packing or unpacking for ages by the time you’re done. I’m not sure where I was when the “ants in the pants”/want to pack early gene was passed out but I clearly missed it… I instead suffer from “but it’s cozy here an I don’t wanna pack” syndrome. Sigh. I guess it’s time to start anyway. If you have seen where you are moving and know the floor plan, add an extra label to the top of each box for the movers, who won’t want to traipse around the house looking for ‘blue rooms’ or potential lounge, dining or study rooms, which all look the same when empty. I add directions from the front door (or main entry point), such as “Downstairs 1st right”, “Upstairs 2nd left” etc. When they pick up each box the label is uppermost – this also informs extra helpers such as new neighbours who might be on hand. The same goes for furniture where possible. Although we’ve moved several times (but only in the same town, no big moves across the country) I’ve found it helpful to pack everyone a suitcase – changes of clothes, medicines, toiletries are in each person’s suitcase. Everyone is responsible for keeping track of their suitcase, and we pack them in the car, not the moving truck. I’ve found this so much easier than trying to rummage through boxes at the end of a long day moving and cleaning and sorting. No one wants to have to look for their toothbrush or underwear in a moving mess. When I quit my job to backpack Europe, I put all of my stuff in a storage unit too. One of the tricks I used is colored duct tape for each type of room aka kitchen or closet, so I could quickly go in once I got back and get what I need. I also packed each box so I could lift it myself, which is probably the smartest thing I did. You can also find free boxes at places like the ABC/Liquor Store.. they have TONS of empty boxes and once I had them for my move, I stored them in my attic so I have it for my next move since I know I won’t be staying where I’m currently at permanently and seeing as usually your next move tends to be bigger than your last due to a growth in your home.. new furniture.. added things you’ll have to move ect.. at least I’ve have a large part of the boxes I will need. 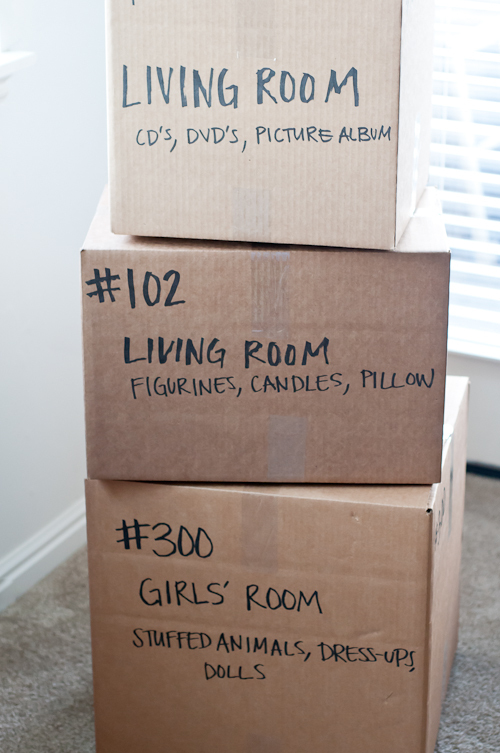 Also, I too, label my boxes by room =) it’s quite helpful and that way when we are unloading.. I just automatically have those boxes placed in whatever room they are meant for. Next time, I will definitely write everything down that’s in each box because even with them labeled I end up losing track of where things are. i love using apple boxes for moving boxes – you don’t have to use tape, you can still access what’s inside easily (lets you start packing earlier), they are uniformly sized, and they don’t get too heavy that way (although i use orange boxes for books). After 2 coast to coast moves in 18 months, my best tip is to have a ‘last on, first off” box. Mine is a big, plastic container with lid on wheels. Sheets and blankets for each needed bed. TP, napkins, paper towels, light bulbs, batteries, coffee pot, and some mugs, glasses, silverware and plates. (disposable works great!) Coffee or tea bags….. and you can survive the first night. One tip my Mom used was numbering the boxes and the rooms. 3rd floor room 1 = 3-1 and used a file card taped to the door frame – Room 3-1, easy for movers and friends. Moving is an emotional time, having a packer does eliminate stress and can be affordable in a large home. Try to pack your bags ahead of packers or isolate an area of items not to pack and mention it to your packers, check the cabinets for meds, food for the drive, paper plates/cups, TP, linens for arrival. 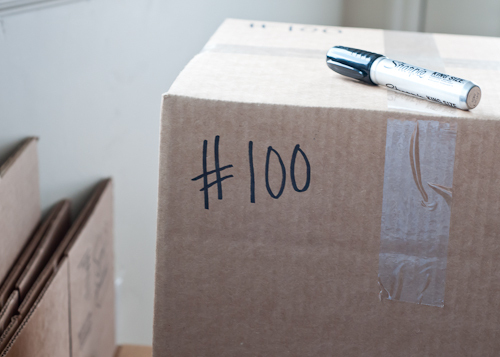 If packing yourself, heavy items go in small boxes distribute the weight. Canned goods, try to add light stuff in box too. Breakables, crinkle paper to pad box bottom and around edges and top. Linens are great to use to wrap large items. med boxes are good for lamps, pad bottom, removed shade and sometimes the harp/bulb, wrap lamp, pack harps and other tall items in too, add small pillow between and top box with another med. box, tape bottom of top box to bottom box. Pictures can fit in flat boxes with padding the corners. Wardrobes, clothes. tall items, shoes on bottom. Use clean paper to wrap, loose wrapping is cushioning. 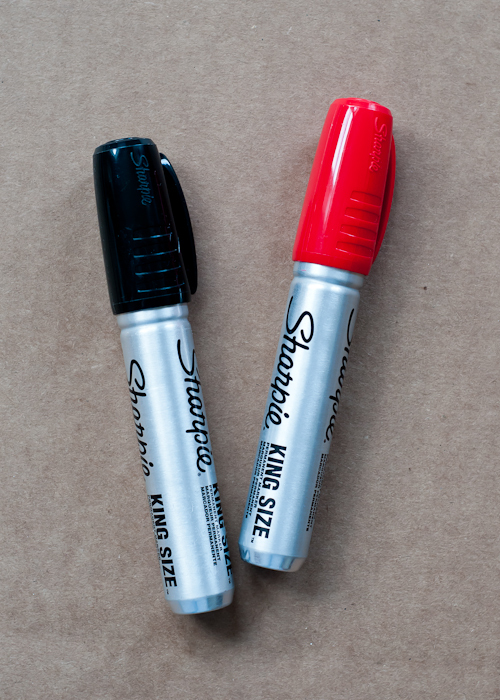 Markers write on tape. Don’t be too specific on boxes, Kitchen- coffeepot you have an idea what other stuff is in that box. Don’t write tools write garage/kit drawer. Large boxes are good for bedding, lamp shade, light items. FILL BOX so they don’t collapse when stacked in truck. A great tip is to go to places like Bed Bath and Beyond or Michael’s and ask for boxes ahead of time and they will save them for you free of charge. I have worked retail for a while so most of the cardboard gets thrown into a compactor and recycled; sometimes even thrown away. Plus, since my husband ,who is deploying, is already under enough stress your tips were very helpful!! Thank you!!! Much appreciated!!! One tip i absolutely loved (and don’t remember where i first saw it) was to pack those very heavy things (like books) into suitcases on wheels, it makes them so much easier to move. Especially if you’re moving yourself. As much as I hate paying for boxes, having all of our small, medium, and large boxes be the same size is a HUGE help when it comes to loading the truck. The last time we moved we had a mixture of free boxes from the Dollar General down the road and boxes we purchased at Lowe’s. The Lowe’s boxes were so much easier to load and cut down on the arguments! Plus, there were no random dead spots that no box would fit in. We saved the boxes we purchased last time, and I plan on buying more the next time we move. Also, if you have a lot of hanging clothes (my husband is a pastor, so we have a TON), it is worth it to buy one (or two!) wardrobe boxes from U-Haul. I have a system that I use very much like this one. 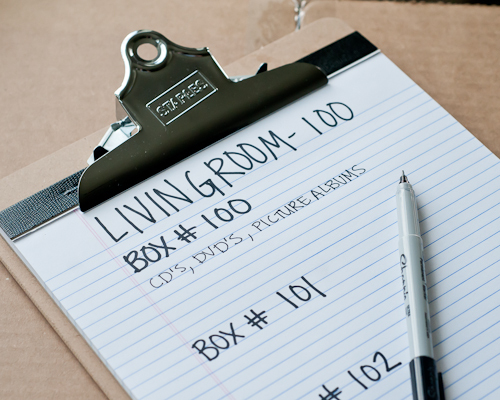 I have a small pad of paper, about 4″ X 6″, that I used to write the room the box goes in and the items in the box. I copy the list 3 times and tape one to the short side top and long side of the box. It worked great for our last move. This time though I think I’ll use your master list idea and the numbers, that will help me know if something is missing and if so, what it is! thanks for the tips! This may be a silly question, but what do you do past #900? Do you create #1000, #2000, etc. even though it may be confusing with the hundreds numbers? Hi Lianne! That’s a great question. I guess I’ve never needed to go that high. ha! But yes, that’s probably what I would do, I open up the parameters of the other numbers to include the other rooms. I had too many rooms to use the #’s so I used letters instead and then added a number after for each box from that room. I even coordinated letters that I could like B-for bathrooms or K for Kitchen, just no duplicate letters. Utilize luggage!! Why would you pack a suitcase into a box when you can pack your heavy books into it? If you’ve got a suitcase with wheels then you hardly have to haul them at all. I also had a closet in a empty spare bedroom in the new place. So, when I was packing, I designated that closet it’s own color. And that was where I put all the boxes of knick knacks, pictures, vases, photo albums….all the fun decorating stuff that you know you won’t be unpacking for at least a few weeks. It was all out of the way until I was ready to unpack it. You could do the same with Xmas decorations. Give them their own color. Mine were just designated to “garage/gray” And if you don’t have an extra closet, you can set up a sections in a basement or garage or even a spare room that won’t have any furniture. Think of them like “zones”. Set up zones for yard/garden stuff…..craft stuff…..sports equipment…..work-out stuff…..you can even use painters tape to create actual zones. Then your items are at least where it should be and ready to unpack when you need to deal with them, but out of the way for the time being. If your friends are coming to help, utilize their cars for the drive over to the new place, by having them take the TV’s, stereo’s, any fragile items, lamps, pictures, monitors, grandma’s china, plants….etc. Then these won’t take up room in the moving van and you will feel better knowing they will arrive safe and in one piece. I also wrote out directions and handed them to everyone before the 4 car caravan and moving van left for the new place across town. On moving day morning, I had to go get the moving van. So, with time a factor and all those last minute things you cannot do until the actual moving day – I just left the house key under the mat for whoever arrived first and taped written instructions to the living room wall of what needed to be done still. In my note (and an email to them the day before), I designated certain friends for certain tasks. My IT friend was in charge of my computer break down and set up. My cable friend made sure my vcr/dvd tv was down and then working at new place. My other friend took care of the disassembling and reassembling any furniture. No idle hands! I came back with coffee and donuts, of course. I designated a girlfriend to make sure my bed was made (I packed up a rolling suitcase with my bed sheets, blanket, pillow, make up, toothpaste, hair brush, soap, towels, etc) and that was in my car on move day, which I gave to her when we arrived. So, at least I knew at the end of a long day I could shower, and my tv/cable and internet would work and I had a clean, made bed to sleep in the first night. At the end of a long day, all my friends and family said…..it was the easiest move they ever participated in! Mission accomplished!! I always have a box marked “Box #1” in large letters. In it, I put a roll of paper towels, dish and hand soap, an all purpose cleaner, dish sponge, scissors/box cutter, toilet paper, and any other item that will be the last used in the old place and the first needed at the new place. It normally goes in my vehicle with me. It’s a great help to have those items instantly handy. Here’s a good idea for packing drinking glasses or wine glasses, etc. ; wine boxes from your local grocery store! The boxes hold 6 – 12 glasses depending on the size, there are individual dividers between each one so they don’t touch! Just ask the liquor person to save them for you. Hope this helps someone! I’m a project manager by profession, so moving is not fun but I plan it thoroughly. We don’t use the moving truck concept- we used Door to Door Storage (there are many similar companies) which deliver small 9 foot containers that you pack your stuff into, and then you lock the container with your own padlock with your own combination. Your stuff is not at the mercy of truck drivers. They pick up the containers and store them for you until you’re ready to have them delivered in your new location. This allowed us to move out in stages — we used 9 containers, and it also allowed us to stagger our unloading on the other side, specifying which containers we wanted delivered in which order. We hired our own labor on each end, and we did label the boxes by room as suggested in this article (great article). This also allowed me to delay the arrival of our containers for 2 weeks while I supervised the painting and carpet installation of the new house. So it allowed us to avoid that pressure and chaos of having to so closely coordinate leaving the old house and arriving at the new house with all our stuff. Thanks for the post. I do the exact same thing! Except that I color coordinate and number each room (exactly as you have). If I have time before hand I go through the new house and tape the colored paper above each room’s door so that the moving helpers know exactly where the “girls bedroom” is. I also kept an excel spreadsheet with columns of room numbers and items listed and just carried the laptop around with me as I packed. And about halfway through I just printed it off and left another page blank, and like you, carried it around on a clipboard and hand wrote in the items. This clipboard stayed with me for weeks after we moved, as we unpacked, so I knew exactly where everything was. I also reccommend packing a suitcase of 3 days worth of personal belongings, like you were staying a hotel, for each person in the family, and that stayed in the car with you. So that when you arrive to your new home you could live off these sets of clothing/toothpaste, etc until your basics were unpacked. Also, pack toys last so little kids still have toys to entertain them and the kids don’t feel too many changes at once. It doesn’t shake up their world as much. Good organized mom can move whole world. Just kidding, but that is very important,, also good moving company and things will go as easy as you want. I have a “huge smile” on my face! While reading your tips, and, viewing your photos, I thought “we could be sisters!” LOL For my sister is 13 1/2 yrs younger than me and would just throw up her hands and saw – you do this – to anyone in hearing range during a move!!!! (Really) This is my second in a period of 14 months and my 6th in 10 1/2 years. I am getting good at it, but, this is our LAST thankfully. I did everything you suggested except I did put the names of the rooms for I did not want to confuse my husband. We are the only ones moving us usually anyway. This move we have one extra set of hands! Wow. I have been packing for months but we got the house in a 2 week period, so, I would stress that it is NEVER TOO EARLY to pack away “anything that you are not using or won’t be” by the move in date. So Glad that I did this. I just had to share with someone, and, you seem very nice. Thanks for your tips. Enjoy the Easter Holiday! Thanks for the tip.. I probably wouldn’t label my boxes the way I lbeled my inventory sheet however because I’ve had things go missing before when moving.. But I’m loving the idea to keep a move organized because unpacking it all can be overwhelming when you don’t know where anything is or what goes in what room. I saw that you live in the Oakland area, I’m planning to make a move to Oakland or one of the surrounding cities, would it be too much trouble if you could possibly tell me a few areas I DONT or DO want to live in? Any tips you might have would be greatly appreciated! Off to more moving tips cuz I feel like you can never have enough! When replacing the carpet in my apartment everything had to be packed then moved to lobby. I numbered a sticky note to the wall (wall 1, and position on wall, items on side table 1-1, couch 1-2, end table 1-3– boxes had corresponding # written on them . Next wall was 2–. Then when movers brought things in they put boxes under sticky notes on walls. All I had to do was open boxes and apartment back in order. Some people said I was being a little OCD, but new carpet installed and everything back in place in that day. I once had a friend whose husband was military tell me that when they were moving back to the US from Europe, the crate with most of their furniture somehow fell off the ship. Great article! I would also add that for dishes you may want to purchase special dish boxes. These have padding and dividers so that the plates don’t break. There are also boxes for lamp shades, glasses, etc. Also, if you are moving a mattress you might want to buy a mattress bag. If you are only moving across town, you can put a beach towel in the bottom of a laundry basket and put a stack of dinner plates in it, then fold one end of the towel over the top. Next put in plastic items and fold the last end over the top and tuck it in. This can go directly in your car. Use a second basket for bakeware or pans (no super heavy pans), anything you will want right away. Your dishes and pans will not get dusty from being in boxes in a moving truck and you will be able to use them immediately when you arrive. I have also wrapped my silverware tray in a bath towel and placed directly in the bottom of a bin that I filled with necessities that I will use immediately: 2 kitchen towels and wash cloths, dish soap, hand soap, toilet paper, paper towels, a few bath towels and wash cloths, gallon ziplocs filled with meds, toothpaste, soap, shampoo, shavers and a ziplock with all the remotes. Every family member has a suitcase with 2 days of clothes, their favorite toys/electronics, cords, alarm clocks, a book (or 4) makeup and blow driers. Suitcases go in the car and immediately into their new rooms. When my kids were little, their toys went into colorful bins with lids. They were easy to keep track of and the toys went into the new house first. The toys stay clean in the bins and can easily be used as a makeshift toy box until their rooms are set up. Thanks for the tips for making a move smooth. Keep it up.